My blissful sleep was rudely disturbed by the ear-piercing “chirp” of the calling bell. My bedroom’s upstairs, and located right adjacent to the calling bells. Yep, you heard (or rather read) it right – ‘B-E-L-L-S’. There are a total of three calling bells at my place, two of which are ‘strategically’ placed above my bedroom-door. There’s this obnoxiously-loud bell that chirps (well, literally, if the sound(noise) emanated a cuckoo is “chirp”) at a few hundred decibels. Now, our chirping bell has its switch at the staircase and it successfully serves its purpose – to rudely shake me up from my slumber! 😐 The bell is the last arrow in mom’s quiver to get me downstairs. She’d press the switch for minutes on end, until my tympanum explodes to smithereens. Needless to say, the arrow was spot-on. Exasperated at having missed-out my afternoon-nap, I grouchily hobbled down to mom. It was about five thirty in the evening; my tummy grumbled and mouth watered as my biological clock sounded its alarm. Coffee time! The mental reverie of expected evening snacks brought me back to the high. Only to be thoroughly disappointed – we’d run out of milk and I was instructed to go get milk from the friendly-neighborhood grocer. Worse, mom wouldn’t pay me! If I wanted coffee, I’d have to get milk with my own money – mom rambled on about responsibility. I shrugged; Mom wins hands-down. 😐 I fished a hundred rupee note out of my jeans pocket and trudged out in pursuit of my evening snack. Quite a sight, it was. 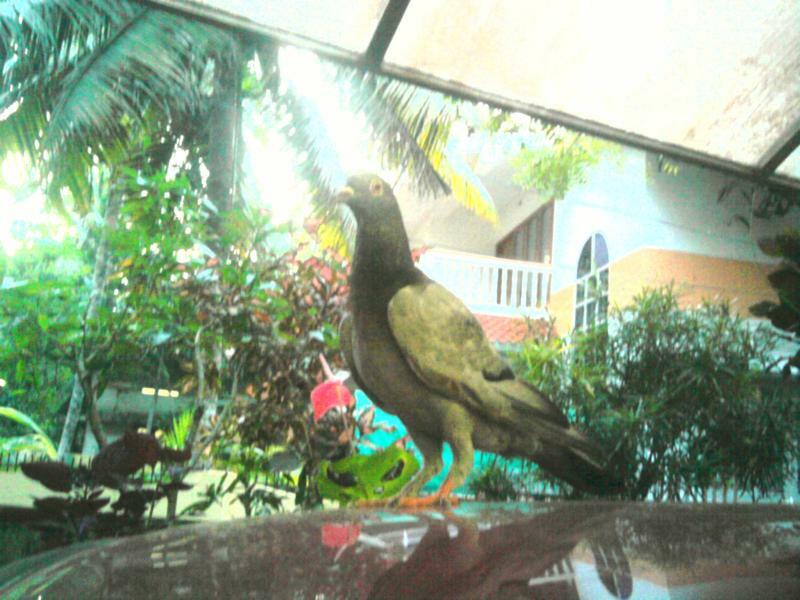 A pigeon is not the first thing you expect to see on top of your car, especially when you’re still hung over with a two-hour nap. (Inception? I momentarily searched for my totem! 😛 ) It wasn’t one of those pretty-pigeons that you see in period movies. Mostly dark, its wings and beak were the only white parts of its body. Cliche talks about snow-white pigeons that delivered letters proclaiming love. But cliches were a far cry for our friend; she could barely fly. Dark pupils stared at me from its orange eyeballs, as it hobbled atop the car to catch a glimpse of me. The pigeon wasn’t magnificent, but it had its elegance. Taking care not to disturb the bird out of its idyll, I rushed into the kitchen and brought mom out to the veranda.Incensed that I hadn’t purchased the milk, she didn’t believe me at first, but I cajoled her out, and made her see the pigeon for herself. She was a tad too endeared than I was. The motherly affection took over; before I knew it, she was back with a few grains of rice which were carefully doled out to the birdie. But our chic was gracious enough not to accept the offering; it moved away from the grains, the tiny tummy was probably full. In the meantime, neighbours were informed and soon my verandah was a makeshift-menagerie. Dad, who announced his arrival from work with a groan, dog tired, dumped his files to join the commotion. 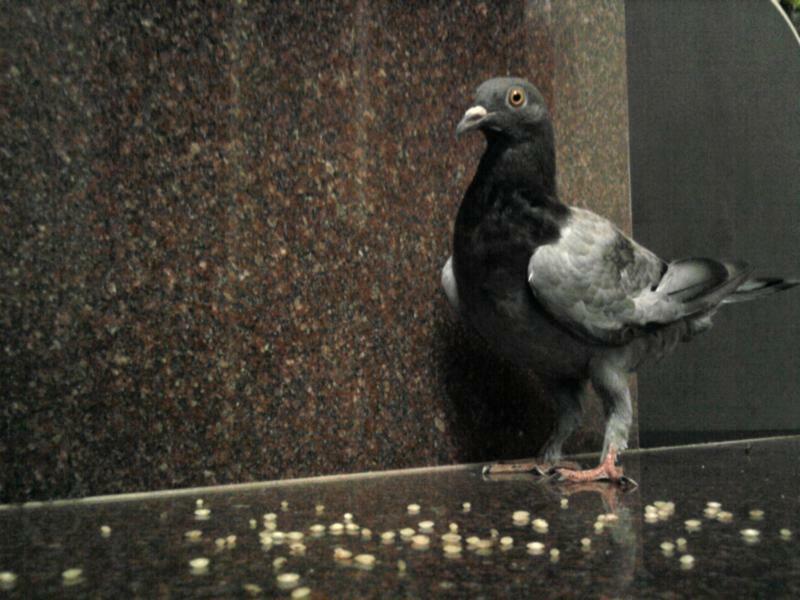 The pigeon was a mini-miracle that couldn’t be missed. Soon, speculations were high in the air. How (or why) did the bird came over? Why isn’t the bird eating? Is its tummy full? Why is it greyish-black and not white? All questions were left unanswered. Some consensus was conjured-up on the arrival-reason though. The ‘injured-hurt’ theory (dad used some logic to put his point forward) won hands-down, beating ‘divine intervention’ (mom’s idea) and joblessness (yours truly). Neighbours were equally ecstatic about our visitor. They took turns to touch and caress the bird. The kids were super-excited – Aravind, a third grader, pulled its wings, scaring our bird into a momentary frenzy, in turn making its captor cry. It took a chocolate to pause the tears of the little ornithologist; he maintained the theory that the bird ‘bit’ him despite the lack of visual proof. The bird peered back at us, inwardly smiling at all the hullabaloo. It was 7 PM, when the neighbours had left and I finally went out and bought the milk, an hour and a half out of schedule; not that I was complaining. I was pleasantly surprised when I returned, The bird-that-would-not-eat was now belligerently-pecking at the grains it once ignored! It was still seated atop the veranda-platform. I tiptoed close to it and watched. No sooner did I approach it, the incessant pecking halted, and the bird turned to me. So birds value their privacy! Interesting. 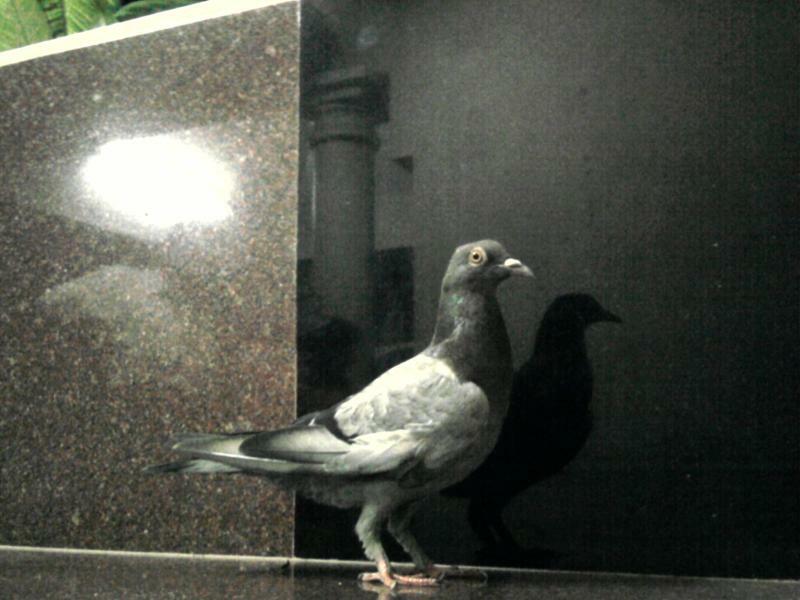 I shrugged, delivered the groceries, and ran back to the drawing-room window to check Li’l Ms. Pigeon out. As expected, she was eating to her heart’s content in our absence. 🙂 I called my parents and showed them the phenomenon. After some brainstorming, we decided to allocate a safe shelter for our new tenant. The verandah-slab, on which she was still perched, wasn’t exactly safe for an immobile bird. We reached a consensus on building a temporary shelter for our bird. Now, there’s an attic (more of an plastic-roofed terrace guarded by metallic-grills) at my place. We decided to lodge the pigeon there. Dad brushed up his engineering knowledge and conjured up a makeshift-home from an old computer monitor cover. Mom gently grabbed the bird and took it to the terrace. Suprisingly, the bird cozied up to my mom, not showing the slightest attempt of protest. I smiled. 🙂 A pitcher of water, and more rice grains were brought, and the ‘shelter’ was affixed on the sunshade within the attic. Our little pigeon had her own home, complete with a tiny door. Yes, she could go out and grab some fresh air if she so wanted. The pigeon seemed to love its new home – it resumed pecking the tiny grains, gobbling up water from the tiny pitcher, fully aware of our presence, this time. We were all happy. The pigeon was here to stay. The three of us dispersed. Dad returned to his laptop and files, mom rushed back to her cooking and I returned to facebook. After dinner, I thought I’d pay our buddy a visit. I simply couldn’t get enough of her! 🙂 I’ve always wanted a pet, but refusal was all I got whenever the request was made. 🙁 When I was in the eighth grade, my uncle had gifted us an Alsatian pup, and it was an offer my dad couldn’t refuse. I was overjoyed! 🙂 But the days of joy didn’t last – good ol’ Robin died a tragic death. 🙁 Since then, I’ve been craving for a pet. Perhaps the li’l pigeon was God’s gift. The more I thought about it, the more joyous I became. Even though the pigeon wasn’t exactly ‘adopted’ as the ‘resident pet’, I had already done the honors in my mind. I actually was on the lookout for a good name for my good old pigeon. With an involuntary smile pasted on my face, I opened the door to the attic and stepped out. I didn’t switch on the light, it was bright enough – full moon day. Besides, the light might actually disturb her meal, for, the flurouscent lamp was adjacent to her shelter. A muffled ‘thud’ and a scamper. Must be one of those coconuts – our attic is dangerously close to a coconut tree, and the roof routinely-suffers from the fall of stray coconuts. I moved towards the sunshade. Curiously enough, the ‘shelter’ was missing from the sunshade. Duh! Did dad remove it or what? Dad has this fetish of ‘arranging proper things at proper places’ and he wasn’t exactly enamored about the sunshade being our bird’s abode. He was the one who suggested it in the first place, cause he couldn’t stand bird-crap on our marble floors, but he didn’t feel it was right too. He must’ve shifted the ‘shelter’ to someplace else. I decided to find out on my own. I got back into the hall that led to the attic and switched on the lights and returned, humming a mock-James Bond tune. Investigation time! I paused on my tracks as I stepped into the attic. Before I knew it, I’d stopped humming too. My fists loosened, my eyes dilated as my heart started beating faster. The makeshift-shelter lay collapsed on the attic-floor, along with the steel pitcher. Water was splayed across the floor, along with grains of rice. Tiny black and white feathers were spread out in different parts of the floor. There was a long, oval shaped, red stain on the floor, formed by droplets of blood, fresh-smeared. A tragic ending indeed. The bird should have been locked up. Would have saved its life… I offer my condolences. Anyways… Take it in a positive light. You actually fed a poor starving feline a scrumptous lunch! After all, cats are humans too!